Rainer Niermeyer and his team provide consolidated consulting services in the field of Human Resources Management. Years of project experience in change management of individuals and complex organizations form the basis of their activities. Success in Human Resource (HR) Management is determined by a holistic approach and the integrated cooperation of all stakeholders concerned – internal and external. We offer services that ideally complement and expand the performance range of the captive HR departments. All our management consultants and trainers have many years of professional experience in the field of Human Resources. We operate in cross-functional teams with a broad knowledge base. During the project top management is thoroughly involved in all steps we take. Our tailor-made interventions take into consideration the special characteristics of the respective organizational and personal environment. "Rainer Niermeyer disenthralls the “Authenticity Myth”. He offers a fundamental recipe for success in leadership." This is how you successfully change your company. Efficient changes of processes are the pivotal drivers for success in business activities. Successful change is made by people. 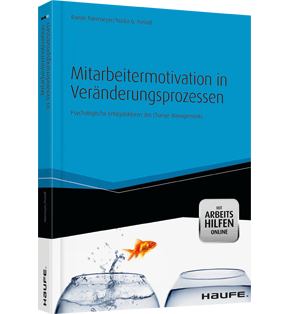 This book provides a guideline to inspire people to embrace changes and to devise change processes successfully. The authors illustrate how to employ “soft factors” and psychological know-how to efficiently transform your company. The book analyzes each individual phase of the change process and provides practical recommendations for the direction and motivation of your staff. The authors impart management knowledge and knowledge of the human nature, since felicitous changes are made by people! Myths and truths about motivation. Motivation in change projects: a step-by-step analysis.